Request Network for WooCommerce – Accept cryptocurrency payments on your store with the Request payment gateway for WooCommerce. 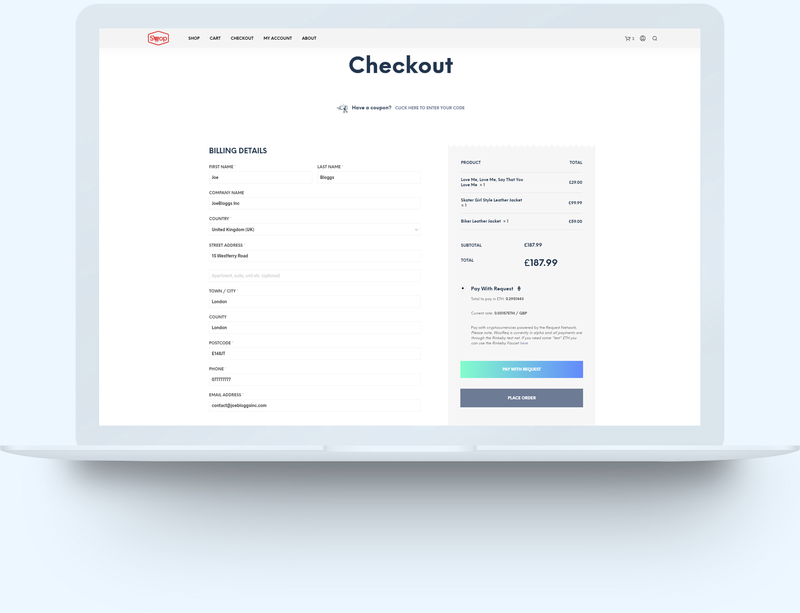 Request for WooCommerce is a simple way to accept cryptocurrency payments on your WooCommerce store, with no setup fees, no monthly fees and no hidden costs. Why accept cryptocurrencies with Request? Request Network for WooCommerce is now live, view more information about the plugin here. Credit cards can take up to 7% in processing fees on every transaction. Accepting cryptocurrencies with WooReq means you’ll pay less than 0.1% on every crypto transaction. Get access to a global customer base by accepting borderless digital currency payments. You can receive payments for any amount, from anywhere in the world. Other payment methods force customers and businesses to shoulder the risks and costs of payment fraud. 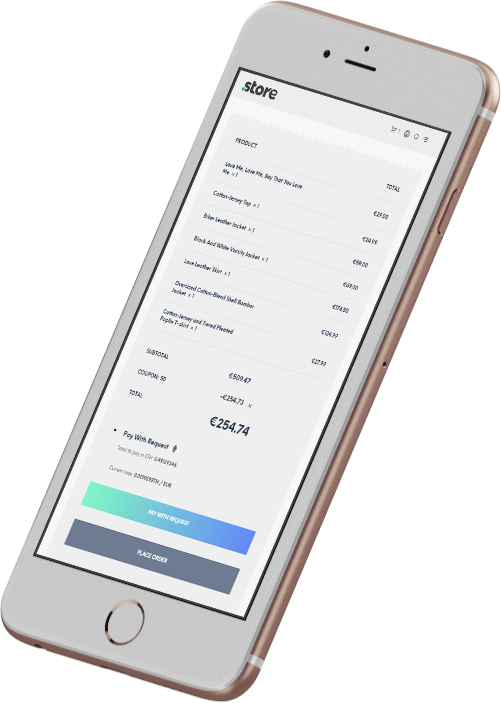 With cryptocurrencies, customers can pay without handing over sensitive personal information, and refunds are made through the merchant — no chargebacks. No third-party apps are needed to receive a payment such as Paypal, Stripe, or any accounting software. WooReq makes the payment experience seamless. Request seamlessly integrates into WooCommerce, with a simple non-technical installation process you can start accepting cryptocurrencies in seconds. 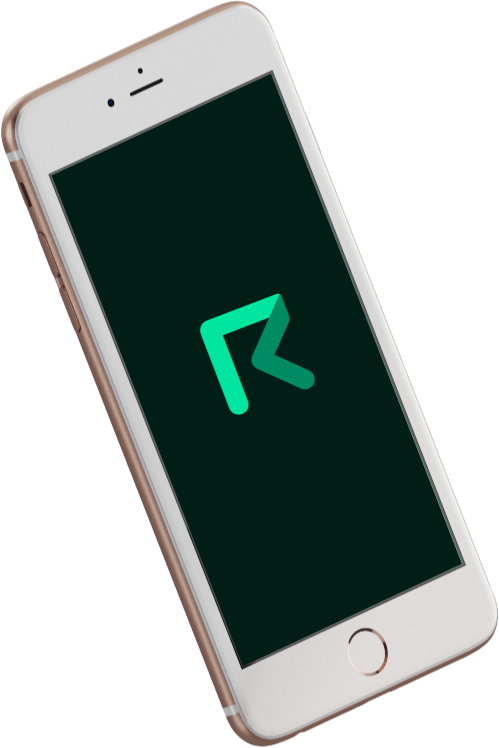 Request is a decentralized network which allows anyone to request a payment (a Request Invoice), where the recipient is able to pay in a secure way and all the information is stored in a decentralized authentic ledger. This results in cheaper, easier and more secure payments and allows a wide range of automation possibilities on top of it. For more information on Request, the Request ecosystem and what Request could do for your business check out the Request Network website. Do you run a WooCommerce store? We would love to hear from you, if you are interested in accepted cryptocurrencies on your WooCommerce store, please contact us here.